Remke Tuff-Seal Cord Grips with Internal Conduit Threads are UL Recognized and CSA Certified for use in both indoor and outdoor applications to prevent cable pullout, control arc of bend, and to provide a tight seal against environmental elements such as dirt, moisture and coolants. Made from machined aluminum, these cord grips offer the same features as our RSR Cord Grips and can be ordered with or without wire mesh attachments and accommodate conduit sizes from 3/8” to 1 ¼”. For applications known for their severe conditions – such as oil & gas, marine, food & chemical processing – these cord grips are available in nickel-plated aluminum. 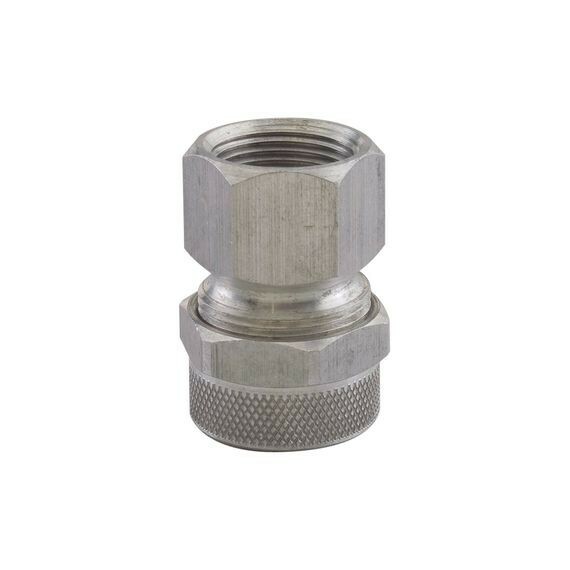 Providing exceptional corrosion resistance and high wear resistance, nickel-plated connectors also feature an attractive finish similar to that of polished stainless steel. These Tuff-Seal grips protect cable from damage and pull-out and are used in conduit hubs or knock-outs at the point where the electrical cable is to be terminated.